WASHINGTON — A group of protesters gathered Monday morning at 3rd and M Streets in Northwest to call for transparency following a deadly police shooting that occurred near the intersection two weeks ago. Protesters went into the street and stopped traffic on New York Avenue for a short period of time during the morning rush. Police diverted traffic around them and it caused backups in the area. 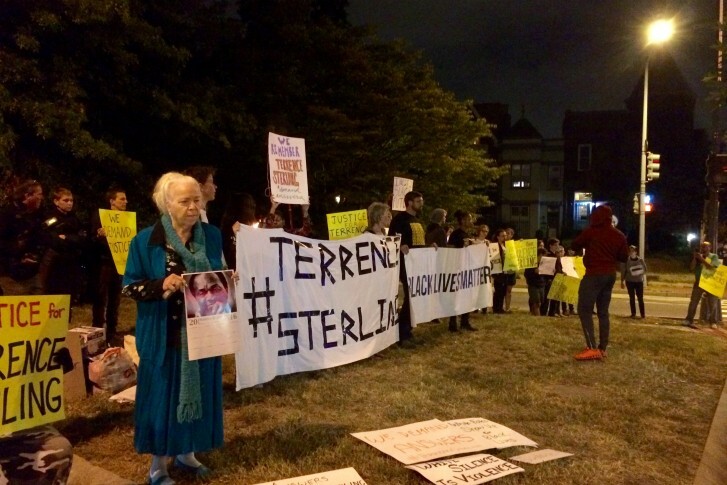 Terrence Sterling, 31, was shot and killed by an officer the morning of Sept. 11. Police say Sterling drove his motorcycle into the passenger side of a police cruiser during a traffic stop, prompting an officer who was leaving the passenger side door to fire his weapon at Sterling. “I know that there’s great officers, but these bad cops are putting a bad name on them,” said demonstrator Jerry Swanson. Both the officer who fired his gun and the officer who was driving the cruiser have been placed on administrative leave. The city has not released their names. “There needs to be transparency, at least to the family,” Swanson said. Protesters also want to know more about why the officer who fired his weapon did not have his body camera turned on. Investigators have said the body camera was activated only after the shooting took place. What footage exists has been turned over to the U.S. attorney’s office for the investigation, officials said. The shooting led to a change in the department’s body camera policy. When police respond to a call or have an interaction with citizens, they must now confirm with dispatchers that they have their body cameras turned on.